One of our fellow readers, Mr. Saurin Patel has asked the big question in mind of many others. "Every stock going up and up..Is this like 2000/2007 bubble in midcap/small??". 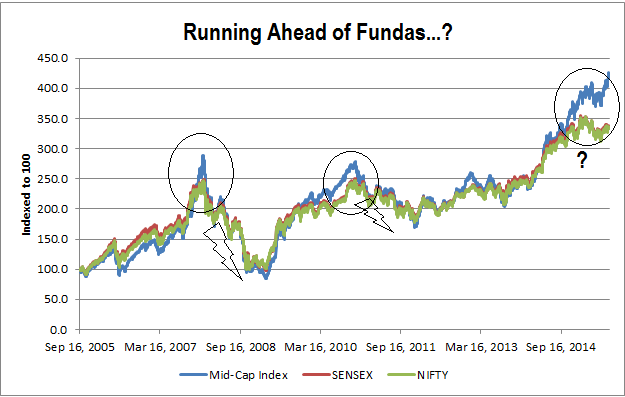 Yes..The mid-cap index is once again running ahead of the benchmark nifty index. Currently mid-cap index is trading at its life time high levels and its performing exorbitantly better when compared to nifty index. Now the worrying factor is whenever this happened for a long-stretch, the market corrected subsequently. Experts are pointing out the examples in 2008 and 2010. The BSE Mid-cap index has outperformed the BSE Sensex by around 26 per cent since April 2014, the biggest and longest period of out-performance since the midcap index data became available in 2005. The mid-cap index is up 58 per cent since the April 2014 against 25 per cent appreciation in the Sensex and 27 per cent rally in Nifty during the period. In 2007-08, the mid-cap index had out-performed Sensex by 16.5 per cent in run-up to the market crash of January 2008. The mid-cap index had gained 24.3 per cent in 50 trading sessions ending January 7, 2008. In comparison, Sensex had appreciated by only 5.7 per cent during the period while NSE Nifty was up 6.3 per cent during the period when market began to correct thereafter. In 2010, the mid-cap index has out-performed the benchmark indices for over a year between October 2009 and November 2010. At one point, its was up 17 per cent relative to Sensex and 19 per cent relative to NSE Nifty. Dhananjay Sinha, head institutional equity, Emkay Global Financial Service is keeping the view that since FIIs are not participating, this rally may slip into negative zone. "Its always tough to justify a rally if the foreign investors turn bearish. FII flows is smart money as they try to pre-empt events. In contrast, the domestic flows have always been cyclical and investors try to ride the market momentum,"
Data shows that FIIs ownership of BSE 500 companies declined to 23.9 per cent at the end of June 2015 from record high of 26.3 per cent at the end of March 2015. During the period, public (non-institutional) holding increased to 10.3 per cent from 8.6 per cent while domestic institutions (insurance + mutual funds) raised their effective ownership to 11.3 per cent from 10.3 per cent at the end of FY15. The flows have since slowdown raising fears of a market reversal. Mutual Funds have witnessed highest redemption in the current financial year in the month of July. Prabhat Awasthi, managing director & head of equity, Nomura India says that there isno point in comparing with 2008 fall as it was due to global economic meltdown. "When you look at periods like 2008, midcap valuations had run high. But the subsequent fall was on account of the global economic collapse in 2008. So it may not be appropriate to draw a conclusion based on such events. When it comes to such issues, one has to consider if there is too much leverage or too much speculation. I don't think it would be fair to say that either is true at this point in time. 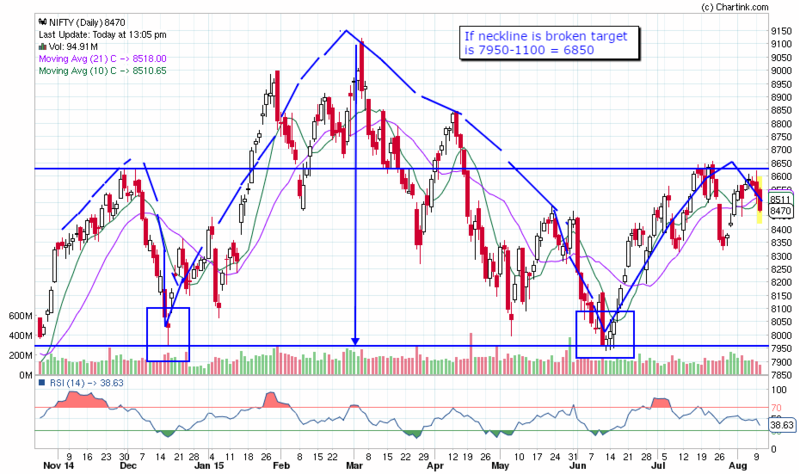 If there is a correction this time around, it is likely to be technical". 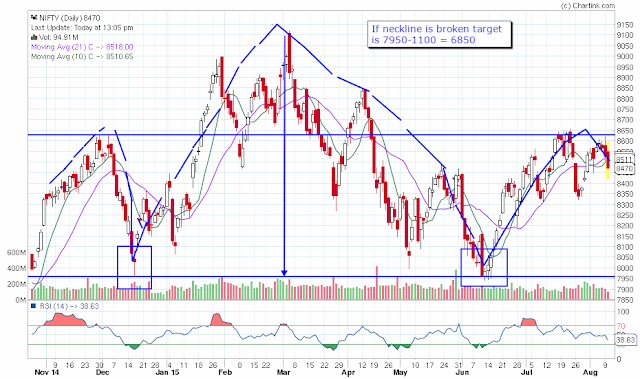 According to Nifty Charts,a head and shoulder reversal pattern is being evolved. See the chart below. There are many political and economic short term reasons as well to support the same. As we always share with our readers, please stick to fundamentals. As Warren Buffet pointed - Only when the tide goes out do you discover who's been swimming naked. Yes the tide is running high now..But lets try not be be part of naked stories! !